A good night’s rest can often be the telling difference between a really horrible day and a truly dynamic one. The amount of restful sleep a person gets goes a long way in making his or her day productive. There is a very real possibility that the relentless search for a comfortable position will result to a sluggish, if not stressful or even pain-filled day. The quest to find a sleep that can rejuvenate a person has led experts to experiment with various materials. Presently, memory foam is the toast of the town. It is a material that is now the most popular material where mattresses are concerned. As it has been proven to be very successful, memory foams are also making some headway when it comes to pillows. 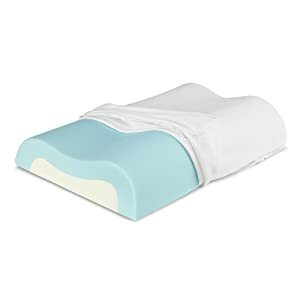 The Sleep Innovations Cool Contour Memory Foam Pillow is gaining quite a following because of the kind of comfort and support it provides. It features a number of benefits that can really help a person get that much sought pain-free and restful sleep. For added measure, it has a cool foam that makes sleeping even more comfortable. Proprietary Sure Temp Memory Foam, which holds the shape of the user for the entire sleeping duration. Highlights a cooling layer of foam that is supposed to make the sleep more comfortable. The contoured design personalizes comfort and cushioning to alleviate pain and enhance comfort. Comes with a 5-Year Warranty against factory defects. Proudly carries the tag of USA-made product. The Sure Temp Memory Foam molds the shape of the user and holds that shape until the sleeper wakes up. As it holds over time, the sleeper does not have to toss and turn while looking for that preferred comfort. It should give the individual all the time he or she needs to get a good night’s rest. Customized comfort and support are the best benefits of a contoured design. As the comfort and support are personalized, it also means a lesser chance of getting aching muscles while comfort and cushioning are enhanced. This is the kind of design that works on the tension and pressure points of various parts of the body. Sleepers who go for the right mix of cradled comfort with just a hint of firmness often prefer the 3-pound density of the memory foam. A 3-pound foam also does an exceptional job in dispersing the sleeper’s weight throughout the pillow. When weight is evenly spread, there is much better stress relief and should also help in easing the pain from troubled spots. This is a feature that is very important as substances that cause allergies and dust mites should be taken seriously. As a person spends a good number of hours in bed, a pillow that is resistant to allergens and dust mites can certainly be very good for the user. The manufacturer claims the cooling foam system to be very effective in making every sleep cool and comfortable. This is probably specifically designed as some memory foams tend to gather heat, which may be the cause of a restless sleep. The most common downside of a memory foam pillow is the distinctive smell it brings. It should be noted that there are options that emits only a neutral odor, which is so much better compared to the rather strong smell coming from this pillow. The best solution to this issue is to air the pillow out for a day or two or to spray Lysol on it for a much quicker effect. The cooling effect, which is supposed to be the distinguishing feature of this pillow, is not something the users are really impressed with. Most of the people who have used the product are rather appreciative of the pillow’s ability to really personalize the comfort and support for a very long time.